Tuesday morning began with a student panel sharing how they use technology followed by a fantastic keynote by Jennie Magiera. She was so inspiring with her love of education. She encouraged all of us to not only help students find their voice but also to find our own and not try to be someone else. We need to shatter the "single story" and realize that each person has his or her own story just waiting to be told. Ms. Magiera said she loved being at ISTE because it felt like a wizard convention. She shared a memory of reading The Hobbit as a girl that led her to realize that "teachers are fun-loving wizards who can help you find your whole self," as she was quoted in an article on the ISTE website. She also pointed out how social media rarely shows an accurate picture of a person and we need to be willing to show our warts. Many people have similar problems and we can all support each other if we are open. She encouraged us all to share our untold story, with the encouragement that in this technological age, we don't need to wait for an audience, but to put ourselves out there and the audience will find us. Although it has been a month and a half since the conference, as I reread my notes, tweets, and articles associated with the conference, I can still recall the inspiration I felt after listening to her speech. 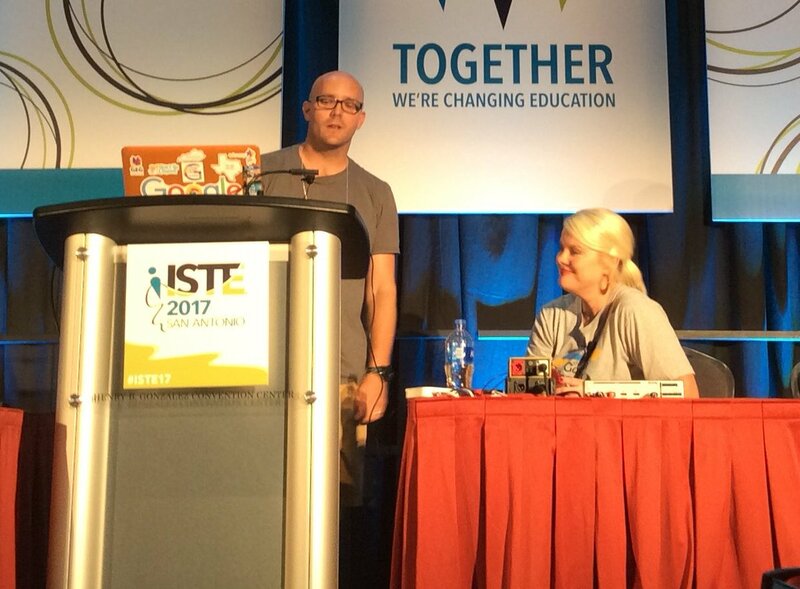 The next thing on my schedule was a session called ISTE Bytes. In that session, nineteen speakers gave previews of what their sessions were going to be about. I was able to take notes on contact information and topics to look into further, even if I wasn't able to make it to the session. This was followed by a session called "15-Minute Learning Products That Feed Student Agency," presented by Howard Martin from the Austin ISD Instructional Design Team. Mr. Martin began by encouraging us to model what we expect of our students--how to get devices out, use them, then put them away. We don't keep markers in our hand all day in case we need them. Help students be accountable for their devices instead of taking them away. He also urged us to focus on the content, not the tool. One of our main goals needs to be finding ways for students to take ownership in learning. The websites and programs that were new to me in this session included: Sketch.io, ClipChamp, Lensoo, and Ipadio.com. He also mentioned the importance of scaffolding projects using these tools and reminded us that "choice builds voice." During a short lunch break, I looked around the vendor hall briefly, collecting information from businesses I wanted to know more about. My next session had me a bit starstruck. "Geeking Out Over Google Classroom" was being presented by Matt Miller and Kasey Bell. I have been listening to their podcasts and visiting their websites: Shake Up Learning, Ditch That Textbook, and Google Teacher Tribe. Kasey and Matt went over some upgrades to Google Classroom and features that all may not know about. They shared that personal accounts can be used now, and it is possible to differentiate and give students direct access to assignments. They showed how to customize the header, told about the difference between class comments and private comments, and gave a tip to put initials at the beginning of the comments. These comments should not be answers to Discussion Questions. When talking about student choice, they reminded us that students are used to "playing the game of school" so we need to stop feeding them everything. They shared that students can snap a photo to turn in, for example when Spanish kids are learning a new word, have them take a pic to show understanding. They also shared a link to their presentation: Geeking Out Over Google. One of my goals for the conference was to learn more about Chromebooks to help with our district roll-out so I signed up for a special session called "Chrome App Smashing to Create Chromebook Generated Videos." Unfortunately, this session had technical difficulties with their presentation and also with the internet connection in the room. I also should have realized that I would need a Chromebook, rather than just using the Chrome app on my device. I left the session and looked through the poster presentations until my final session. I QR codes of most of the presentations and saved to my Google Keep to look at later. My final session was called Google Apps with YouCubed.org Math Activities. I have been using YouCubed.org with my gifted students for a couple years now and was interested in seeing Jo Boaler and Alice Keeler working together on this. With Visual Mathematics, teachers need to present things in many different ways to cause communication between different pathways in the brain. They had several useful quotes, such as "focusing on test-taking has no impact on learning," and "being fast is not the same as being smart." Research has proved that collaboration does improve learning. Putting YouCubed problems on Google Apps allows students to communicate with each other and critique the reasoning of others. Teachers need to praise efforts, not intelligence and remember that it's not about the problem. It's about the understanding. Productive practice equals seeing an idea in different ways, forms, and representations, not the repetition of one idea in near identical questions. After hearing them speak, I ordered both speakers' books: Mathematical Mindsets by Jo Boaler, and Teaching Math with Google Apps by Alice Keeler. I ended the day with a reception sponsored by Quizzizz where we answered questions in teams, competing with each other, then went to the historic Aztec Theater for EdTech Karaoke. Anyone who thinks tech people are just nerds stuck behind their computers has never experienced this phenomenon. These people were serious competitors! What fun!